This high-efficiency model adapts the latest Toyota Hybrid Synergy Drive from the new-generation Prius, already proven to be an MPG winner. A new multi-link rear suspension improves both handling agility and ride comfort compared to the previous-generation Corolla Sedan. Cutting-edge tech features found inside the cabin help you stay connected and monitor your efficiency. Standard Toyota Safety Sense 2.0 features an advanced suite of integrated active safety features to help you stay prepared for the unexpected. 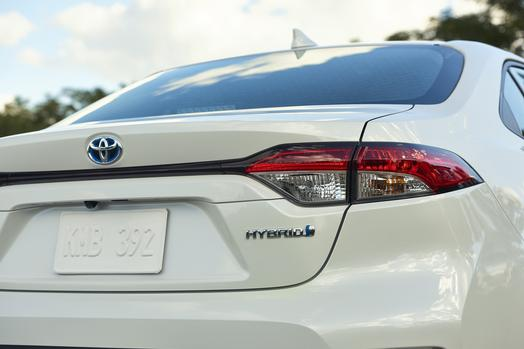 The 2020 Corolla Hybrid is only the next chapter in Toyota’s indisputable global hybrid leadership, which began more than 20 years ago. Providing decidedly responsive performance along with tremendous efficiency, the all-new Corolla Hybrid is powered by a 1.8-liter four-cylinder gasoline engine with two motor/generators. Part of the new-generation Hybrid Synergy Drive, the battery’s smaller size and flatter shape allows it to be tucked underneath the rear seat, as opposed to taking up trunk space. Under normal acceleration, the battery provides a subtle power boost in order to put less strain on the engine and eliminate the “rubber band” effect found on most hybrids. Along with the standard NORMAL and ECO drive modes, a SPORT drive mode setting allows for an increase in power for stronger acceleration response when necessary. 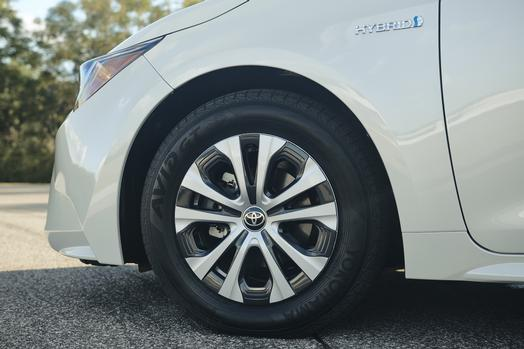 15-inch aluminum alloy wheels with low-rolling resistance tires help boost efficiency. The end result is a projected 50+ MPG combined fuel economy rating for the 2020 Toyota Corolla Hybrid**. Power comes in the form of a 3.0-liter twin-scroll turbo six-cylinder produces 335 hp and 365 lb-ft of torque paired to a quick-shifting 8-speed automatic transmission with paddle shifters. These impressive performance figures make the all-new Supra the quickest Toyota-branded production vehicle to date. A low center of gravity, perfected 50:50 weight distribution, and rear-wheel drive platform gives the Supra the agility and confidence to help you attack the apex of the corner. A blistering top speed of 155 MPH and a 0-60 time of just 4.1 seconds highlights the race-bred excitement found in the all-new 2020 Supra. You’ll have your choice of two individual driving modes — Normal and Sport. By engaging Sport mode, throttle response is sharpened, transmission shift crispness is improved, and exhaust sound is amplified. 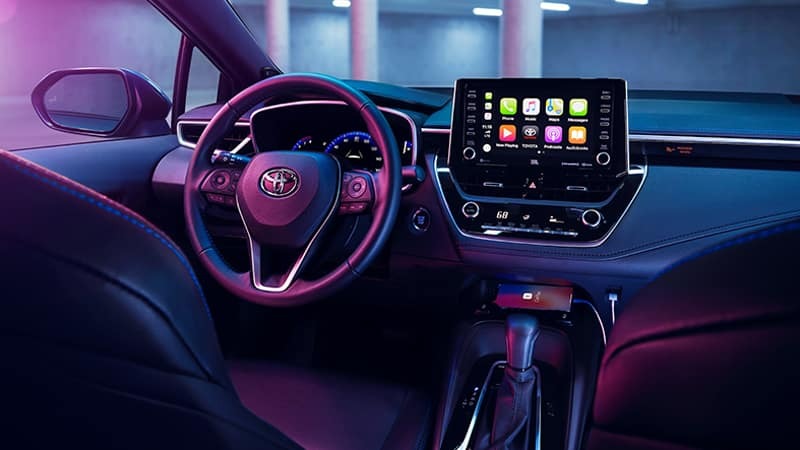 Included as standard on all 2020 Corolla Hybrid models, Toyota Safety Sense™ 2.0 gives drivers an advanced suite of integrated active safety features. Its Pre-Collision System is designed to automatically activate the brakes to help avoid a collision or mitigate the impact force. Dynamic Radar Cruise Control works by maintaining a set vehicle-to-vehicle distance and can even stop when the vehicle ahead comes to a stop. Road Sign Assist can recognize speed limit, Stop, Yield, and Do Not Enter signs and display them on the vehicles MID to help assist the driver. Lane Departure Alert with Steer Assist provides steering assistance if it detects the possibility of leaving the driving lane along with audible and visual alerts. Eight standard airbags and Toyota’s Star Safety System round out the impressive collection of safety innovations found on the Toyota Corolla Hybrid. **Projected fuel economy rating. Official EPA testing results have not yet been released.